Trieste, home to ICTP, is located in the northeast corner of Italy, close to the Slovenian border. It is easily reachable by plane, train and car. Arriving by plane, one can choose to land at Ronchi dei Legionari airport, Venice Marco Polo Airport, or Treviso Airport. Trains operated by Trenitalia travel frequently between Trieste and major Italian cities, and there is a train stop located conveniently close to ICTP. Buses are available for local and regional transport. For further details please see links below. Arriving by plane, one can choose to land at Ronchi dei Legionari airport, Venice Marco Polo Airport, or Treviso Airport. Italy's national train service, Trenitalia, operates frequent services between Trieste and several major cities in Italy. Visitors to ICTP can take the train until its endpoint (Trieste Central Station) or, on selected routes, they can disembark at the stop "Miramare", which is conveniently located just up the hill from ICTP's campus. Reaching ICTP via the motorway: Take the A4 motorway from Venice-Mestre, or the A23 motorway from Tarvisio- Austria. Follow signs for Sistiana-Strada Costiera, then take route SS 14, a panoramic road leading directly to the city centre. 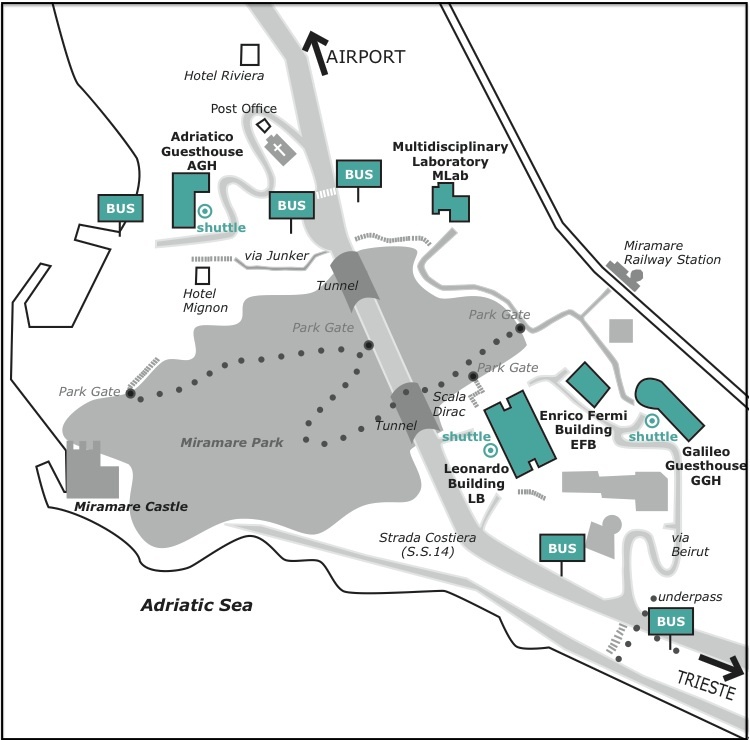 The ICTP Campus - Grignano/Miramare area - is about 15 km from the motorway at Strada Costiere, 11. Click on the link to learn more about what you need to do before you arrive at ICTP. How, when and where to apply for a visa. Italian Law requires all foreigners to have valid health insurance coverage while in Italy. The InfoPoint & Switchboard Office provides general information about ICTP's offices, services, activities, schedules, conferences, lecture halls and their locations on the campus, telephone numbers, shuttles, guided tours, etc. The InfoPoint staff offers general information about the city of Trieste and its surroundings and handles enquiries about transportation, museums, cultural activities, sightseeing, and weekend activities downtown. The ICTP campus is divided by the Strada Costiera, a busy thoroughfare connecting Trieste to Motorway A4. Narrow sidewalks and heavy traffic make walking along this thoroughfare dangerous. There is a pedestrian crossing near the bus stops. Visitors are advised to strictly avoid crossing the road at other points, least of all in the tunnels. The footpath in Miramare Park offers a pleasant pedestrian route between the Adriatico Guesthouse and the other ICTP buildings. The local bus lines running between Trieste and ICTP depends on the season. Between June and September, Bus No. 6 runs between the city (including the Central Railway Station) and Grignano. The end-of-line stop, Grignano, is on the seafront, a short distance from the Adriatico Guesthouse.